A chaotic schedule can mean last minute packing, and inevitably, a chance of forgetting essentials. Since I travel frequently, it’s important that I have my pre-flight routine down. If you’re like me, you’ll want to avoid panic and enjoy your flight as much as possible. Packing your carry-on bag full of goodies will help the hours pass and prevent you from hauling more bags than necessary onto your next flight. 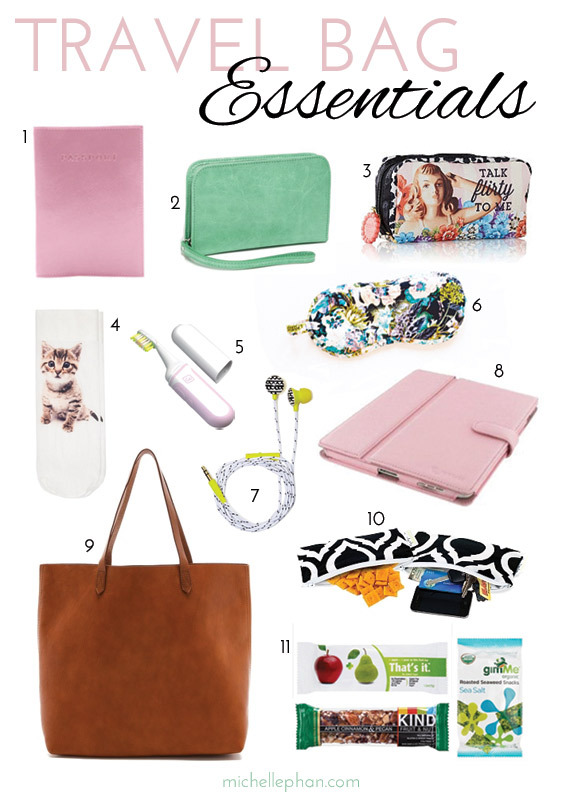 Depending on the duration I might throw a neck pillow and scarf into my bag, but no matter what, the travel essentials below will deliver you to your destination in the prettiest style possible. Passport Cover – A bright colored cover will protect your identification and be easily accessible when walking through TSA. Wallet – A large wallet can carry money, credit cards, and any paperwork or IDs needed. It will also hold your phone, preventing it from rolling around loose in your bag. Cosmetic Bag – If you’re meeting that special someone at the airport or you’ve taken an overnight flight, you’ll want to freshen up before getting off the plane. A cute bag is a perfect way to carry your beauty essentials. If you need tips on how to get a refreshed glow post-flight, watch my video Travel Friendly In-Flight Beauty Tips . Socks If you’re wearing sandals or heels, you might struggle with cold feet on the plane. Packing a pair of socks will warm them up and allow you to better relax sans shoes. How cute are these kitten socks!? Toothbrush – Similar to freshening up your face, you’ll want to have a toothbrush and toothpaste handy after you’ve been snacking and/or sleeping on your flight. Eye Mask – Some people will stay awake and let their overhead lights beam throughout the plane on overnight flights. Bring an eye mask to create total darkness and get the rest you deserve! Headphones – Whether you’re listening to music or watching videos, don’t pay for bulky in-flight headphones, bring your own. Reading Materials – A good book, a couple of your favorite magazines or an iPad are wonderful to have while flying. Travel Tote – A sturdy tote in a neutral color is the best travel bag around. The neutral tone will go with anything you wear, and the large size will not only carry your must-haves, but also transport your work laptop once your trip is over. Reusable Bags – Bringing liquids, snacks, keys, or jewelry on a flight? No problem. These little baggies can keep everything organized and are cute to boot! Snacks – Avoid overpriced plane food and a grumbly belly by bringing your own favorites to grub on throughout the flight. Am I forgetting one of your essentials? Let me know in the comments below!